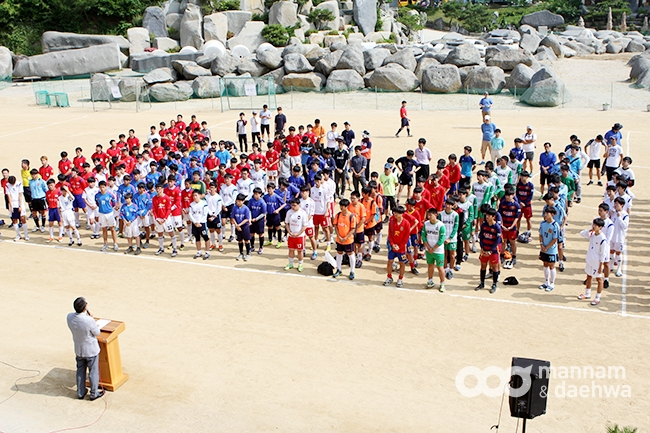 On June 11, the 2016 Youth Peace Soccer Tournament was held in Wolmyeongdong, the Natural Temple. People were so deeply engrossed that they had even forgotten how hot the summer was. The games were separated into two leagues: one for junior high teams and the other for high school teams. A total of nine teams participated in the tournament. ▲ Pastor Jung Beom Seok delivers the opening ceremony message. Pastor Jung Beom Seok who delivered the message at the opening ceremony began by saying, “Soccer should be played in the most peaceful and natural way. But then still, there must be order. Order comes from a heart that loves others as yourself and a heart that makes peace with others.” He also added, “Ultimately the most important thing is not scoring ten goals and winning first prize; rather, it is to help others, love them as yourself, and acknowledge them,” emphasizing one of the key principles of Pastor Jung Myeong Seok of the Christian Gospel Mission. ▲ The Wild Ginseng team from Wolmyeongdong and Geumsan play against the Loyal Vassal team from Daejeon. The Peace Soccer on this day revealed the mentality of Peace Soccer considerably more than any other day. Instead of playing tough and rough soccer, firstmost, the players were considerate towards others by reaching out their hands to help their friends who had fallen or gotten hurt. But the one thing that drew the most attention of all was the fact that everyone rushed over to sincerely congratulate the team that had won, once the game was over. I thought that this may perhaps be the true image of Peace Soccer. It was a fantastic time. Pastor Jung Myeong Seok’s teaching of loving and respecting lives, which was demonstrated first through his own actions, truly shone. This was not the only thing that moved people’s hearts that day. Because the weather was so great, people felt that the Holy Trinity was especially showering them with love. Also, through nature, which is God’s work of art, the magnificent Yongdam Dam with its surrounding mountains made for a great view, and the refreshing rain that poured down a few times during the games provided a grand spectacle. It moved our hearts and left a strong impression on us. There were many young people giving glory to the Trinity for giving us such nice weather. ▲ People congratulate Team Loyal Vassal from Daejeon for winning first place. Conveying joy and allowing all to wholeheartedly delight in the Holy Trinity’s love, the 2016 Summer Peace Soccer tournament has ended. However, Pastor Jung Myeong Seok’s mentality of love and respect for lives still continues, and we will be able to witness it once again in the Peace Soccer tournament that will be held this coming autumn. We look forward to the Autumn Peace Soccer tournament.